Composite doors are fast becoming the entrance door of choice for UK homeowners. Their superior performance and stylish aesthetics have proven a hit and they are now a popular choice for door replacements and new build projects. If you’re a window and door installer and you want to make the most out of the popularity of composite doors, they are an essential addition to your product portfolio. Astraseal composite doors are an excellent alternative to uPVC entrance doors. Their innovative construction means they are stronger, more weather resistant, and more secure than their uPVC counterparts. Our composite doors are manufactured using high quality REHAU Total 70 outer frames. An internal high performance slab is foam filled for maximum insulation and when combined with the multi-chambered outer frame provides outstanding levels of thermal performance. The exterior of our composite doors features a GRP (Glass Reinforced Plastic) skin. It creates an extremely durable finish which is scratch resistant and will not fade or warp with exposure to the elements. It is extremely low maintenance and with only the occasional wipe down will stay looking like new for many years. Whether you work mainly on modern properties or your focus is on period home, our composite doors can be customised to meet all your customer’s preferences. Offer your customers a selection of colours to tastefully complement their home. Bold red, blue and green make a vivid statement while our authentic wood effect finishes are full of character. 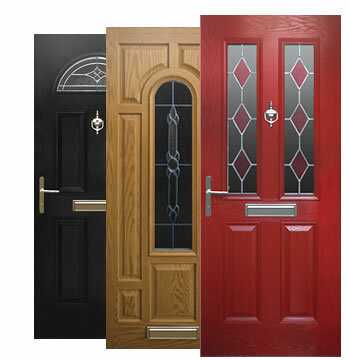 Your customers can choose from a range of door styles for their new composite door. From those inspired by classic architectural design to more contemporary looks, there’s sure to be the perfect style for any type of home. Any glazed areas can feature a range of decorative glazing to create a focal point to the door and bring in more natural light. With a choice of decorative hardware, our composite doors will brighten up the exterior of any home. When you want to offer your customers the best in composite entrance door technology contact Astraseal Trade. For more information about our range of composite doors or any of our products or services call 01933 227 233 or send us a message online.